"Don't play your hand unless you're sure you have that ace in the hole." "Folding was never an option. 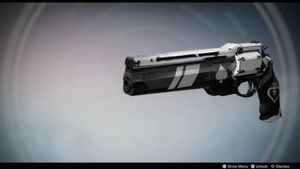 —Cayde-6"
Ace of Spades was a Hunter-exclusive exotic Hand Cannon introduced in The Taken King, which served as the signature weapon of the Vanguard Hunter Cayde-6. It is obtained by reaching Rank 3 Gunsmith reputation with a Hunter and completing the Back in the Saddle quest. It was reintroduced in Forsaken and can be obtained after a lengthy questline following the main story, now available to all Classes. The Ace of Spades was a Hunter-specific Hand Cannon in The Taken King that fits into the mid-impact archetype. The weapon has 12 bullets in the magazine and is capable of clearing entire rooms of enemies without reloading using the Maverick perk, which reloads one bullet from the reserves after a precision kill. In Forsaken, The Ace of Spades, now available to all Guardian classes, can still easily clear hordes of enemies with the Firefly perk, where after a precision kill, the enemy explodes dealing Solar damage. The instrinsic perk it has is called Momento Mori, where reloading after a kill gives The Ace of Spades extra damage power in five shots, making it one of the best exotic weapons in Destiny 2. The Ace of Spades rewards precision kills with two main bonuses: With Firefly, all precision kills become explosive shots that do damage to nearby enemies. With Maverick, precision kills grants a bullet from your ammo reserve into the magazine. Both these perks are more useful against groups of weaker enemies, as they will not activate as frequently with stronger enemies who require multiple shots to bring down, possibly meaning that a player can expend all their ammo without reloading at all. The Ace of Spades returns in the Forsaken expansion. Unlike its Destiny incarnation, it is no longer restricted to Hunters. In PvP, it has proven itself to be an extremely powerful weapon, outperforming hand cannons in the same archetype and others including, but not limited to, Better Devils, Dire Promise, and Jack Queen King 3. Memento Mori grants the user radar even when aiming down sights, a trait which is shared with MIDA Multi-Tool. The perk also grants five increased damage bullets after every kill and reload, and when paired with its Firefly perk, gives it an effect similar the Kill Clip/Outlaw combination seen on other, legendary weapons. However, unlike that combination, Memento Mori's effect remains even when switching weapons, and only wears off when the user is killed or when all five bullets are expended, and not over time. I, Cayde-6, being of sound(ish) mind and body, do hereby and henceforth and heretofore leave all my possessions to the person, alien, animal, or natural phenomenon what kills me. Third Eye: Radar stays active while aiming down this weapon's sights. Truesight IS: Flexible sight. Light, with good recoil control. Strong target acquisition. Steadyhand IS: Stable sight. Optimized for excellent recoil control. Reinforced Barrel: Increased Range. Reduced Stability. Memento Mori: Reloading after a kill loads magazine with a few extra-damage bullets. Grants radar when aiming down sights. Smooth Grip: This weapon is slightly easier to hold and aim. Slightly increases stability. Slightly increases handling speed. Last Hand: Equip this Weapon Ornament to change the appearance of Ace of Spades. Salute to the Colonel: Equip this Weapon Ornament to change the appearance of Ace of Spades. In folklore, the ace of spades is traditionally known as The Death Card due to its long tradition with war. The Hunter Vanguard representative Cayde-6 is seen wielding the Ace of Spades in the official Destiny 2 trailer, killing Cabal while fanning the hammer like the Last Word. It's revealed in Destiny 2 that Cayde commissioned Banshee-44 to have the gun built as his signature weapon. Ironically in the opening of the Forsaken expansion, Prince Uldren kills Cayde-6 with the Ace of Spades, Cayde's own gun. The 'Firefly' Special perk is likely a reference to the television show of the same name. Nathan Fillion, the voice actor for Cayde-6, had a starring role in the show. The Ace of Spades' perks tree. The Destiny 2 Ace of Spades' perks and overlay. The Last Hand ornament for the Destiny 2 Ace of Spades.